Both of us have charter businesses and we know how tough this business is. Rising gas prices, shrinking pro-staff budgets, ridiculous regulations, over fishing, and a struggling customer base. 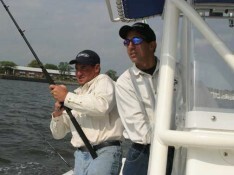 This service is totally free to ALL fishing professionals, this includes our fellow charter captains, open boats, guides, tackle shops, marinas, fishing stations, and outdoor writers. You do not need to advertise to post your reports, in fact fishing professionals are NOT allowed to advertise on the site (level playing field). All the reports are moderated, so we are going to try to keep the B.S. to a minimum. Recreational anglers are NOT allowed to post. There are no comments or discussion boards. Every one of your posts will include your business profile, contact information, and a link to your website (if you have one). Links from your reports will bring you traffic and search engine rank! As for us, all we want is the traffic. Eventually we will find a way to turn that into $$$, share it with everyone who posts, and support the fishing organizations that protect our resource. It only takes a few moments to post your reports (and pics), so stop wondering about whether this is going to work and click here to register now!